Recruitment marketing is depends upon the tactics in recruiting. Recruitment marketing attracts the talented candidates to your organization with unique marketing methods and tactics. The major focus of recruitment marketing is to follow the latest trends in the market and offer solutions to the companies that best overcome these new challenges. Most companies adopt these new recruitment marketing methods to attract talent. Employee referrals also one of the productive ways hiring talent for open positions. Employer branding is the key element in building strong employer brand and thus attract top performers. Recent study mentioned that more than 70 percent companies research about a company reputation and employer brand before applying. So, build strong brand presence in the market not only to build businesses but also to attract top performers wisdom jobs added. Candidate experience is another important recruitment trend that you should adopt in 2019. While candidates who had a better candidate experience will more likely to accept your job offer, re-apply in future and refer others to your company. On the other side the negative candidate experience can spoil the growth and reputation of the company. Candidate relationship management is the latest trend in recruitment world that manages and enhance the relationship with current and future job candidates. Attracting top talent and retaining them is the biggest challenge faced by recruiters in talent acquisition. Many companies are strategically dealing with this issue to retain the top performers. 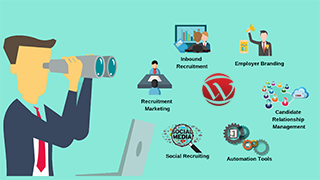 Recruitment automation tools help in finding, attracting, engaging, nurturing and converting candidates into applicants. They streamline, automate and converting candidates in to applicants. Wisdom jobs adopt easy to use Recruitment Marketing and Applicant Tracking System tools to attract and hire the top candidates. Recruitment automation tools manages the overall candidate search, streamline the hiring process and on-boarding the new hires. These tools provides full spectrum of recruitment process such as posting jobs, Resume screening, identifying and shortlisting right candidates without paperwork. Ajay Kolla,CEO,Wisdom jobs noted that Companies are tweaking their systems with automation tools which reduces time, resources and costs and enhance brand presence in the market as well. HR managers and recruiters are following these tools such as social media recruiting, online evaluation, and real-time analytics. Wisdom jobs online recruitment portal says that Data driven recruiting and HR Analytics are used to demonstrate recruiting methods where planning and decision making can be done through Applicants Tracking Systems (ATS) and Recruitment Marketing Platforms (RMP). Human resources industry is continuously developing and changing. So it is important to keep an eye on the latest trends which reflect the recruiting industry in 2019. Using automation tools and adopting the technology trends in the market helps the companies in streamlining their operations.